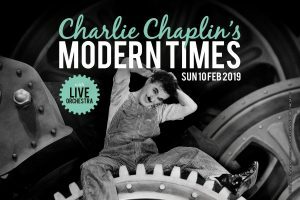 More than a century since his world famous character The Little Tramp first appeared on screen, Bristol’s Slapstick Festival pays tribute to Charlie Chaplin with this concert screening of his outstanding classic comedy Modern Times (1936). A mesmerising gala evening of live music to film in an event showcasing your all-time favourite comedy stars, this spectacular classic comedy gala is perfect for film and comedy fans of all ages. Your host for the evening is comedian, actor and satirist Marcus Brigstocke. Highlights from the evening include a complete screening of Modern Times on a vast HD screen while Chaplin’s own acclaimed score is performed live by a 40-piece orchestra – Bristol Ensemble conducted by maestro Guenter A. Buchwald. With short comedies from Laurel & Hardy and Buster Keaton both with live musical accompaniment and entertainment from the brilliant comedian magician John Archer this is truly a thrill packed evening and not to be missed! A unique opportunity to see slapstick / silent comedy films as they’re meant to be seen – with a bunch of people rolling about in the aisles in laughter and with live music bringing the visual image to life in electrifying style.